10 July 2017: Stephanie Gakuo, UPTAKE project manager reflects on the progress and emerging lessons from the project and the recent SMS campaigns. The full name of the UPTAKE project is Upscaling Agricultural Technologies through Knowledge and Extension. The agricultural technologies include a combination of the use of inputs that include seed, fertilizer and pest and disease control technologies, along with the promotion of good agricultural practices. UPTAKE addresses knowledge through interactive information and communication technologies (ICTs) to enhance agricultural extension messages reaching small-scale farmers. These technologies can include radio, interactive voice response (IVR) and short messaging service (SMS). The campaigns are delivered in defined geographic areas in which another intervention the Scaling Seeds Technologies Partnership (SSTP) is accelerating the adoption of high-yield crop varieties and complementary technologies. UPTAKE collaborates with SSTP to employ ICTs to promote these agricultural technologies. Within the UPTAKE project, CABI implements the mobile telephony component of the campaigns, in this case using SMS. Farm Radio International leads on all aspects of radio communication. Within the title of the project the word extension is also important. What UPTAKE is doing is designed to supplement both conventional extension and promotional activities by agro-input suppliers. Rehema Maulidi, an extension officer in Mshewe Ward, Mbeya Region in Tanzania’s Southern Highlands noted the value of the UPTAKE approach to support her work. Within the five villages she is responsible for, there are an estimated 5,000 farmers. Rehema is very clear how the UPTAKE SMS maize campaign complemented her role as an extension worker. She estimated the SMSs reached about 50% of the farmers in her village. The UPTAKE team is proposing a common bean campaign in 2018 and a potato campaign begins in the third quarter of 2017. Whilst scale is important, so is traction. The ability of the message to achieve the desired change in the target audience. Within UPTAKE we have been working along the value chain. Increasingly we are working with private sector input providers. This is important because we have to target information to fit the seed varieties and other inputs that are available locally. They are also an essential part of final mile delivery of information to farmers. Given farmers reluctance to pay for information, we need to see if we can we present strong enough evidence, in terms of the likely impact on sales ,to encourage the private sector to co-invest in the SMS campaign approach. Evidence from the recent maize campaign in the Souther Highlands suggests this might be possible. SMS could be a very cost-effective investment for input providers to reach smallholder farmers at scale to drive sales. One of our private sector partners was Alinane Shimwela, general manager of Highland Seed Company. They are one of the pioneering seed suppliers in the Southern Highlands. Alinane recently reported to me that sales of improved maize seed grew by between 85-90% following the SMS campaign. Highland Seeds complement the campaign with their own fliers showing the importance of timely land preparation and planting, appropriate spacing, correct fertilizer application amongst other practices. It is encouraging that the private sector input providers see the need for information and information services, that augment traditional extension, to try to ensure farmers receive the return on investment and increased yields that the technologies can deliver. One of the things that our work on the maize campaign in the Southern Highlands has shown is the challenge that climate uncertainty is bringing to farmers. A generation ago farmers would have been more certain of when to plant. The start of the last season planting season was delayed because the rains came six weeks late. We had been given good warning that the rains would be late and were going to be less than usual. This was flagged by the Agricultural Research Institute Uyole with information they had received from the Metrological Department. This information meant more than pushing the message back by a few weeks. It meant that we needed to change messages to farmers to include tips that made them more resilient. 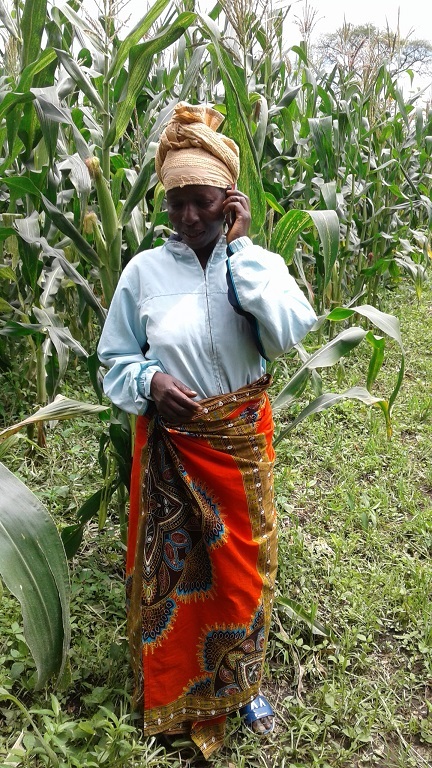 New SMS messages were developed that encouraged the planting of short duration /fast maturing, drought tolerant and disease resistant maize varieties, that were available locally. This shows how SMS provides climate smart solutions to farmers. In March 2017 ARI Uyole raised a second alert. This time it was an outbreak of stalk borer. Once again information was promptly disseminated to maize farmers via SMS. In this case we asked farmers to inspect their fields for the pest and advisories were also given on appropriate pesticides. One farmer we spoke to was Anthony Mwaisembo, from Njerenje Village. The SMS prompted him to check his field. He estimates this saved him losses of at least 10 bags of maize of his anticipated 30 bag harvest. With a bag of maize fetching 50,000 Tanzania shillings (he say’s the sms campaign saved him aboutUSD 300- a sizeable amount of income from his two acre farm. Only electronic media can respond at this speed with targeted and actionable advice being disseminated to farmers at scale. But one of the key aspects that UPTAKE is looking at is how SMS can be made to support and augment other media and approaches. Whilst the SMS is great for sharing dynamic information like market prices, climate information and early warnings of pest or disease challenges, we also know that gathering and disseminating this information in a timely fashion can be a major challenge for most SMS providers. CABI has shown it can respond to this challenge and has earned the respect of our partners and farmers for doing so.